WHAT IS THE BEST INFRARED CAMERA FOR YOUR IPHONE? 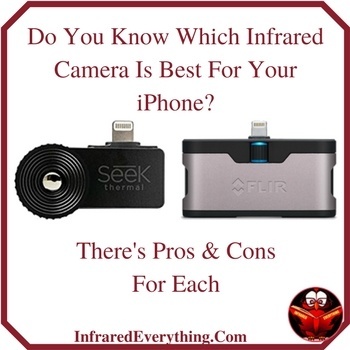 Like I always say, read over my detailed review on each one before you make your decision on which infrared camera to buy for your iPhone. There’s pros & cons to both brands. The Flir One is my number one choice for a thermal imager for your iPhone or iPad. A couple of reasons for this is, I can share my photos on social media & it has it’s own battery. I’m not draining the battery on my iPhone. Flir sells two different types. There’s the Flir One & the Flir one Pro. This review will be on the Flir One as the cost is about half the price of the pro. Keep in mind, the Flir Pro will have a clearer picture. It all depends on what you’re using it for. 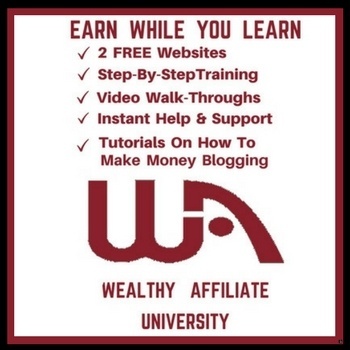 You can look at my comparison chart further down the page. 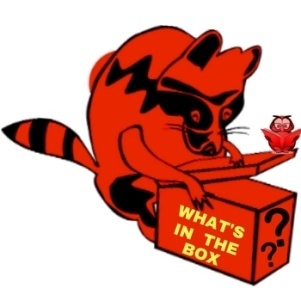 Check over the features to make sure it includes everything you’re looking for. ■ Can Drop It From 1.5m without damaging it. 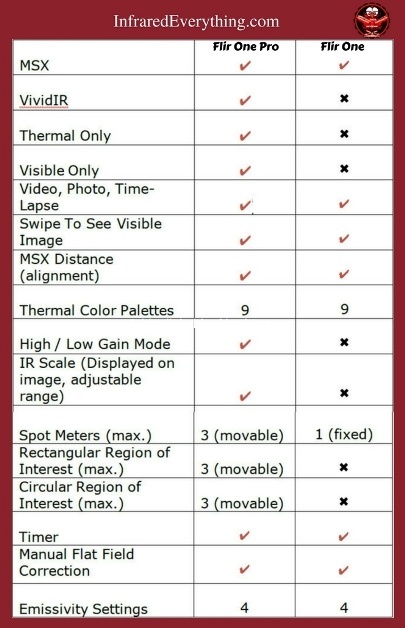 For the People who would like to know the difference between the Flir One & the Flir One Pro, take a look at my chart below. You can check out the Flir One Pro on Amazon to get the specs, features & the price. ■ With the regular & thermal camera together you can see more than a standalone raw thermal image. WHAT’S INCLUDED WITH THE FLIR ONE FOR IOS? Check both companies below before you buy your Flir One. From time to time these companies have a sale on them. At the time I wrote this review, the Flir One for iOS was selling for around $188. The seek thermal camera is really easy to use. You just plug it into your iPhone or iPad, tap on the app & you’re ready to go. You can track game 1800 ft away. You can track things day or night & even through fog & light bush. There’s no problem seeing animals that are camouflaged. ■ No battery needed. It’s powered by your phones charging port. When you charge your phone you’re charging your camera too. ■ Comes with a waterproof carrying case with a key chain attached to it so you can hook it onto something. You don’t actually have to carry it in you hand when you’re walking. 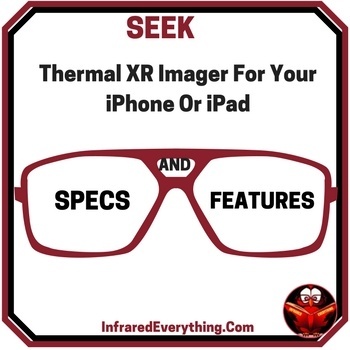 When you purchase the seek thermal imager for your iPhone or iPad, the following is included. I hope my review made your decision a little easier. If you’ve purchased the Flir One or the Seek Thermal, please leave a comment below. 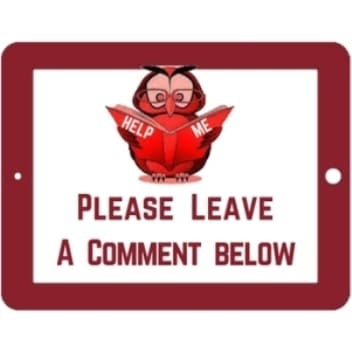 Let us know what you liked & didn’t like. Also, the different things you’ve used it for. If you’d like to see a list of reviews I did on other thermal imaging, infrared, & night vision products, click the link below. Thanks for stopping. 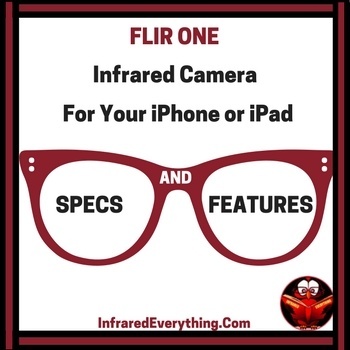 I hope you enjoyed my review on an infrared camera for iPhone.